I get this is the smack forum, but sometimes jumping on is just overkill. Seriously, "chuckles" is the funniest smack name ever. The pole is not really tall enough for anyone but a hobbit to dance around, but I suppose you could just sit on it ... and rotate. when at either pole it is recommended that the only pole dancing be indoors. use your imagination as to why.. This message is hidden because imapig is on your ignore list. Typical. The US flag is center. I wonder who is paying for all that? Probably us so why shouldn't our flag be the center? looking at it, Left to right. I guess you can't post videos down here. Ooooh ... that's a BINGO! Not-so-trick question: what would a compass do there? I imagine it would point at magnetic south, which is a different place (usually). What if you were standing right over the top of magnetic south, though ... would the compass just keep spinning around? 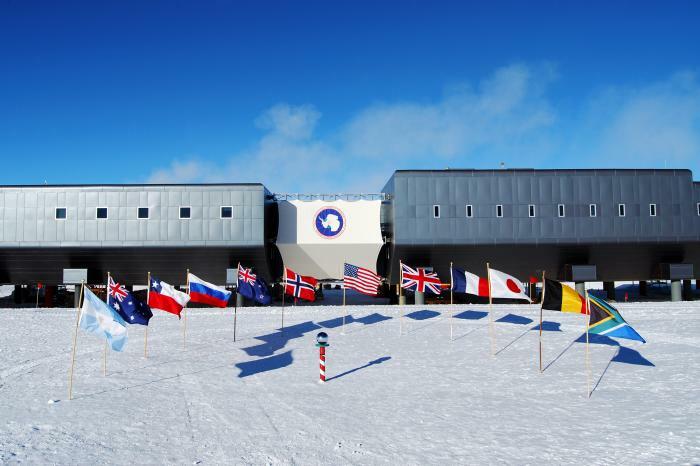 Another thing I've wondered is what the sun looks like from the South Pole on (their) first day of summer, which is coming up next week (December 22nd). I think maybe the sun just "walks around" about 23.5 degrees (the planet's tilt angle) above the horizon without ever setting, and then starts spiraling down the next day.